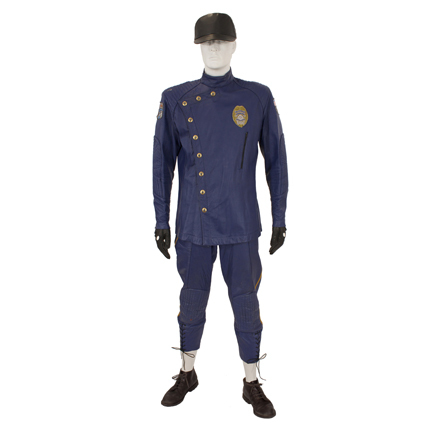 This futuristic “V.R.” police uniform was worn by the character “Parker Barnes” played by actor Denzel Washington in the 1995 motion picture “Virtuosity” starring Russell Crowe. 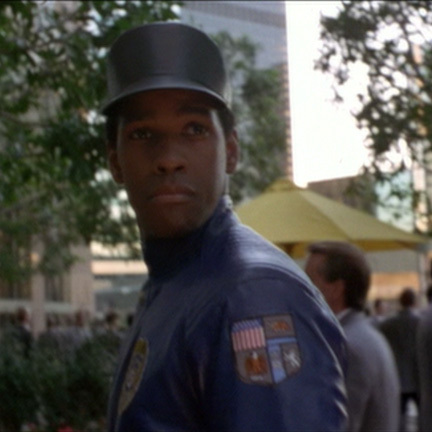 The outfit consists of a blue leather double breasted tunic, matching pair of laced cuff pants with vertical yellow side striping, leather visor cap, a pair of black leather gloves. 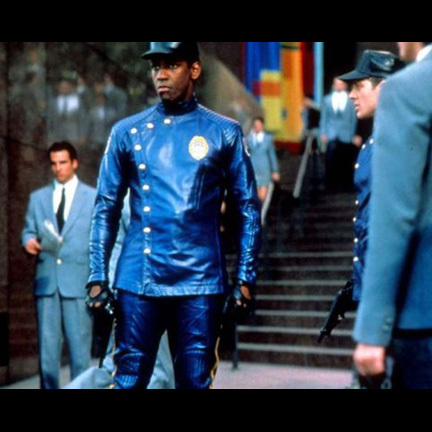 and a pair of dark brown leather boots that were worn onscreen with knee high gaiters (not included). 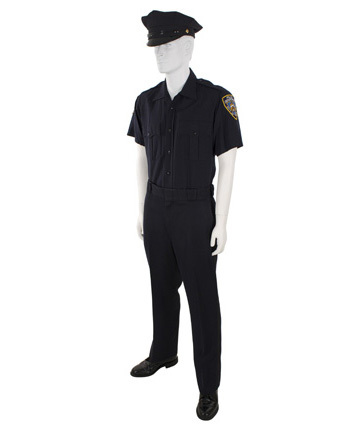 The tunic, pants, and cap were custom made for the actor’s use on the production and the costume is complete with the original custom made “Policeman, Metropolitan Police” and fictitious V.R. 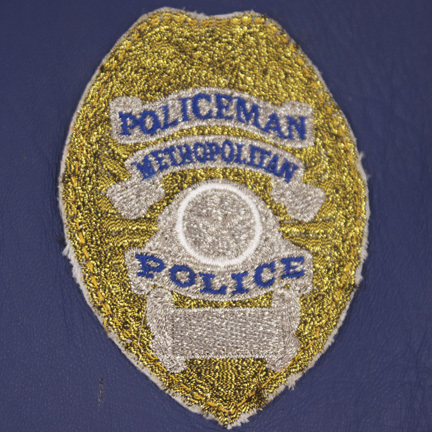 police shoulder patches as seen in the film. 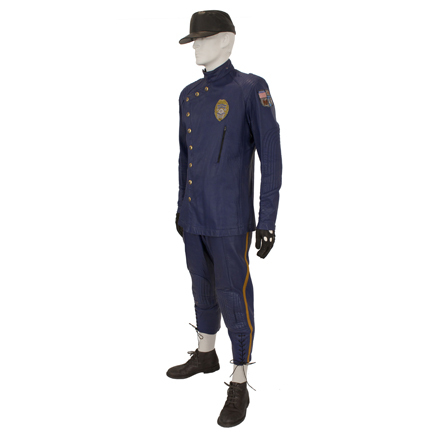 The actor appeared wearing this costume during the extended opening sequence of the film when he and his partner first appear in the “V.R.” (Virtual World) to track down and confront the murderous serial killer program known as “Sid 6.7” (played by Crowe). 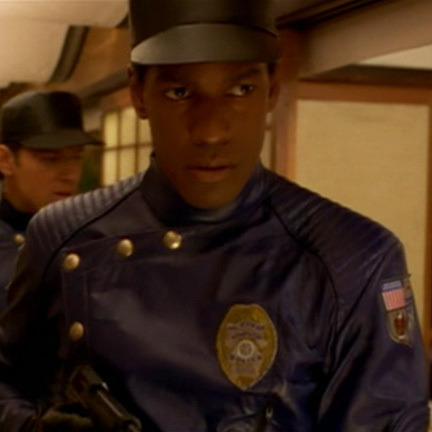 After locating Sid inside of a virtual world Japanese restaurant a gunfight breaks out and Sid kills Parker’s partner. Sid then ambushes Parker and grabs him by the neck before “disintegrating” him back into reality. 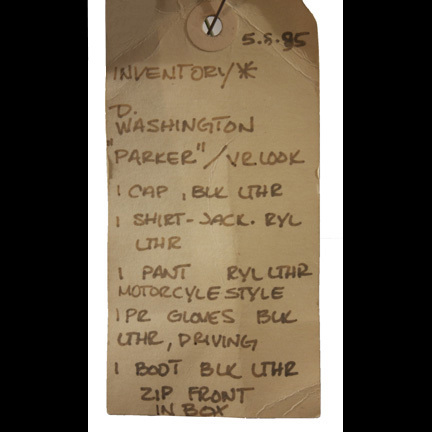 The wardrobe is complete with the original costumer’s tag attached listing actor and character names, scene / change numbers, and complete wardrobe description. 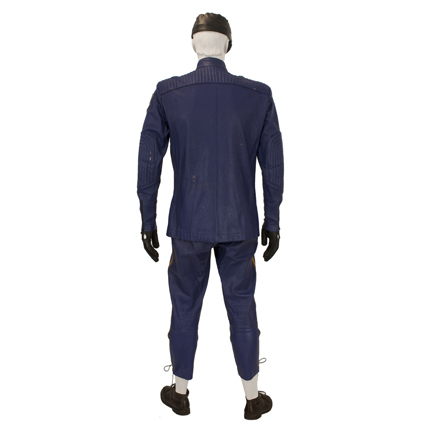 The suit is in good screen used condition with some traces of faux blood on the back and some very minor evidence of distress from its use in the action sequences. 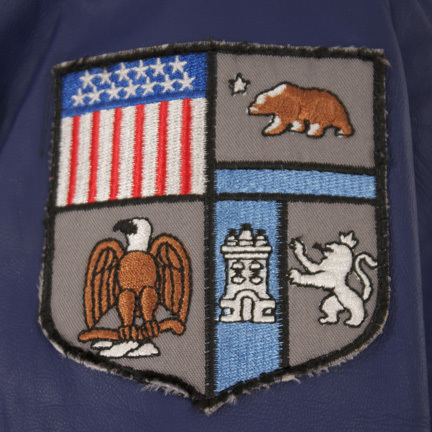 This item is accompanied by a letter of authenticity from the costumer.